One day after Torstar Corp. and Postmedia Network Canada Corp. announced a deal to exchange 41 newspapers – closing the majority of them and wiping out 291 full-time and part-time jobs – federal Heritage Minister Mélanie Joly shot back at suggestions that the closings were due to the government's decision not to offer additional funding for news outlets as part of its new cultural policy. Ms. Joly told reporters in Ottawa on Tuesday that the two companies had made "cynical business decisions" to blame others for their financial problems, and continued to present the Canada Periodical Fund, which provides $75-million a year to magazines and non-daily newspapers, as an adequate vehicle to promote community media organizations. She has promised to modernize the program without providing clear details on her government's intentions. "There are many media companies that have been able to make a smooth transition and have been able to innovate and to be profitable," she said. "It's up to these [two] companies to explain what they will do to develop their new business model. … It's not up to the government to explain the business decisions that were made by these companies." The closings are a sweeping change to regional news coverage mostly in Ontario, leaving three cities suddenly without a daily newspaper and many more markets with far fewer weekly community papers. 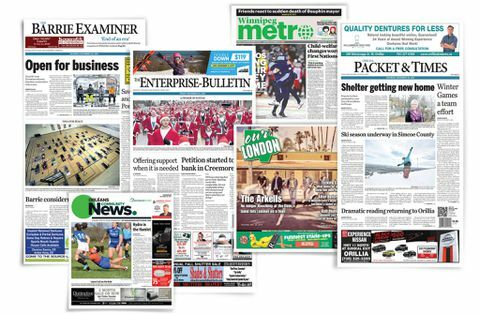 The papers slated for closing have a combined total circulation of nearly three million, accounting for both paid and free papers, according to data from News Media Canada. But they are also part of a larger consolidation in ownership of local news media. "We are trying to pick some areas where we can sustain and stabilize ourselves," Postmedia president and chief operating officer Andrew MacLeod said. "The [alternative] is, you are spread too far and too thin." Since 2008, 234 local news outlets have closed including those announced on Monday, according to April Lindgren, a journalism professor at Ryerson University who runs the Local News Research Project. Of those, roughly 70 per cent were community papers that published less than five times per week, in at least 150 communities across the country. The squeeze on the market is caused by advertising spending that has been sucked away from print ads and into the digital realm. The majority of that new digital spending is going to Google and Facebook, meaning that even media outlets making the transition to digital readership are struggling to make up the difference. The strategy at play when many of these local news closings take place is to reduce competition among struggling outlets, to theoretically corner more of the readers in a given region and offer a more attractive product to advertisers. That strategy is evident in the Postmedia and Torstar deal. The Ottawa region is losing nine free weekly papers covering areas such as Nepean and Barrhaven, Kanata and Stittsville. Without that competition, Postmedia is hoping to be able to draw those readers – and the advertising revenues that follow them – to the Ottawa Citizen or the Ottawa Sun. Torstar is closing a number of free weeklies that could benefit papers owned by its Metroland Media subsidiary in Bradford West Gwillimbury, Innisfil and Collingwood. Metroland's free weekly Niagara This Week no longer competes with similar products in Fort Erie, Pelham, Thorold and Port Colborne. Its free dailies also could benefit if readers of the now-defunct 24 Hours in Toronto and Vancouver migrate to the Metro papers in those markets. Under Canadian law, companies are not allowed to engage in anti-competitive behaviour, which would include agreements not to compete in a certain market or to restrict supply of a product. The closings were not part of any discussions related to the newspaper swap, Postmedia's Mr. MacLeod said. "We didn't know what their plans were, and they didn't know the same for us," he said. Some of the closings eliminate news outlets without a close equivalent: Smaller communities Cobourg and Orillia have free weeklies but are each left without a daily newspaper. The Orillia Packet & Times had been published since 1870, daily since 1953. The closest daily newspaper for both communities is The Peterborough Examiner. Barrie – a census metropolitan area with a population of nearly 200,000 – lost its daily paper, which was founded in 1864. Readers there could turn to the Toronto Star for a daily paper, without the same local coverage. "This is a newspaper that was 153 years old. There is other [news] coverage, but the loss of fact-checked, daily coverage is a big loss to the community," Barrie mayor Jeff Lehman said. The city is still served by online news startup Village Media, the weekly Barrie Advance and local radio stations, he added, but said he is concerned about diminished resources. "The really in-depth investigative journalism that goes on at a community level, looking into the stories behind the stories and surfacing issues … was championed and regularly upheld by the [Barrie] Examiner." The closing of community newspapers continued to reverberate in the halls of Parliament Hill on Tuesday, as many MPs expressed their concerns over the state of local news in their ridings. "If we needed to hear alarm bells to wake up to the crisis in the media industry, we heard them yesterday," NDP MP Pierre Nantel said in the House on Tuesday. In a struggling media industry, many local news outlets face years of staffing cuts, operating on a shoestring by the time they shut their doors for good. "But even though many of these publications have been reduced to shadows of their former selves, they are still often the largest or the only newsroom in those communities," Prof. Lindgren said. "… Even with diminished newsrooms, newspapers cover stories that nobody else covers."